When doing graphics filters I am often annoyed by the fixed dialog most people use, so I decided to try to come up with an alternative solution and this is what I did. 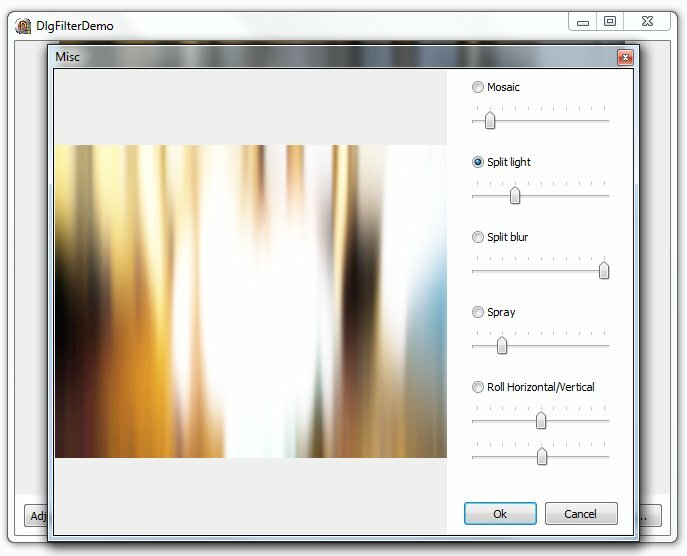 To compile the demo you need to install the included component, rkFilterPreviewDialog. This component will display a dialog according to the instructions in the controls property. You can add a label, trackbar, radiobutton or a space command. You can use the properties CtrlBegin and CtrlEnd to say where the dialog starts and end. From line to line. See demo to get a better view. Remember to set UseBeginEnd when using these properties. Here is the setup for the dialog in the picture above. The demo shows how everything works a lot better than I can explain.